Looking for super power? 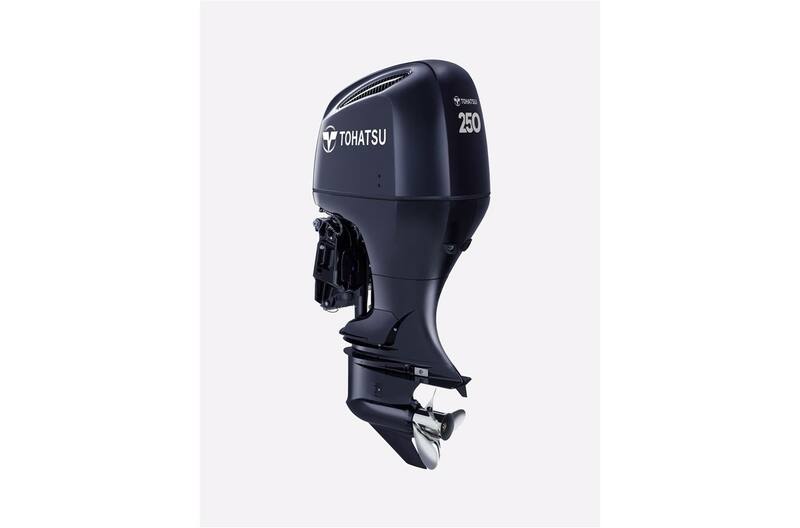 Our largest, highest horsepower four stroke outboard, the BFT 250 hp, brings a large displacement 3.5 liter V6. This narrow v6 design offers top performance and durability, as well as great fuel economy. The high output alternator provides a 90 amp alternator with 60 charging amps. Reliability and durability are covered with the 250hp engine's painted interior cooling passages, providing extra protection against corrosion. Another feature of the 250hp four stroke is the Electronic Control Module. This allows engine data to be interfaced with on-board system displays, such as SONAR or GPS. The BFT 250 hp has another industry-first; separate dual air circuits. This system provides cooler, denser air for better combustion as compared to conventional under-cowl induction systems. Cooler air for your motor, means more horsepower for you! Variable Valve Timing and Lift Control: system provides power where and when you need it. This gives you a broader, flatter torque curve and smooth power delivery throughout the engine's operating range. The result is a superior combination of power, torque and fuel efficiency. Large Displacement V6: A poweful compact 24 valve Single Overhead Cam [SOHC] design. The narrow V6 design offers top performance and durability as well as great fuel economy. Separate Dual Air Circuits - Cooler air, more horsepower: The BFT250 has another industry-first; separate dual air circuits. The first is used to cool the engine where air is drawn into the front of engine and circulated around critical engine components. A top mounted cooling fan draws cooling air over the alternator. The second intake circuit directs cooling air from the upper intake vents, separates out moisture, and then inducts it into the throttle body. This system provides for cooler, denser air for better combustion as compared to conventional under-cowl induction systems. 4-front Corrosion Protection System: A patented, "Double Sealed" multi-layered paint process, sacrificial anodes and stainless steel technology, along with waterproof connectors, all enhance corrosion protection. Transom Height: 20 in., 25 in., 30 in.